President Trump has promised major tax reform since before he was even elected, but so far, no tax bill has been passed. However, we seem closer than ever to having some concrete changes. The Trump tax plan includes consolidating the tax brackets, cutting the corporate tax rate, eliminating many of the deductions that individuals claim, and more. But it remains to be seen if all of those proposals – or any of them – will actually pass into law. In November 2016, Donald Trump was elected President of the United States. At the same time, Republicans gained control of both the House and the Senate. As a result, Republicans now have control of the presidency and both houses of Congress, giving them major leverage to make sweeping changes to the law. Democrats can vote against any proposed measures, but they don’t have the numbers to prevent a bill from passing. Of course, individual Republicans can vote against any proposed tax bill. However, the party seems unified in its goal to pass its agenda. Though Trump had discussed some broad goals during the election and in the early days of his presidency, he did not reveal the specifics until September. Highlights of the plan included lowering the number of tax brackets from seven to three, eliminating the ability to take itemized deductions, increasing the standard deduction, and cutting corporate taxes. The proposal has changed very little since it was introduced. The Senate passed a budget in mid-October, clearing the way for Congress to start considering a tax plan. With the passage of the budget – which includes years of spending cuts and a reduction in entitlement programs – committees are able to work on tax reform. With the passage of the budget, things seemed to be moving forward on tax reform, even though it wasn’t directly tied to a bill or any specific tax action. It just cleared another hurdle to reform, which made many Republicans excited about moving forward as quickly as possible. A tax bill was produced early in November, and it was expected to get a vote in the House soon after. Right now, the bill has overwhelming Republican support, so it is expected to pass both houses of Congress easily. Even with Democrats opposing it, the bill has enough support to pass in the Republican-controlled Congress. After the House and Senate both vote to pass the bill making the changes to the tax code, it will have to go to President Trump to be officially signed into law. President Trump has said that he wants to have the bill on his desk before the Thanksgiving holiday. Now that the other milestones to tax reform have mostly been cleared (or seem inevitable), this goal seems completely reasonable. We could be looking at major tax changes for the next tax year. Some of us may celebrate these tax changes, while others may face more difficulties because of them. Working with a Phoenix tax lawyer can help you make sense of the changes and ensure that you are meeting your obligations under the new laws. The tax code is going to look a lot different from what most people have known in their lifetimes, and that is going to create a lot of potential for error. Only a professional tax law attorney in Phoenix will be able to provide guidance on how to move forward without making a misstep. The professionals at Silver Law PLC are ready to help. Our Arizona tax lawyers represent individuals and businesses with issues include tax litigation, tax audit representation, collections, foreign tax reporting, and innocent spouse relief, among other issues. Our Las Vegas, Nevada tax law attorneys can help you if you run afoul of the new tax laws and get audited, or we can help you with previous tax issues. Tax mistakes can cost you hundreds or thousands of dollars in fees and penalties, and some issues can even result in jail time. Having a dedicated and experienced tax law attorney on your side can help you avoid such penalties or minimize them. 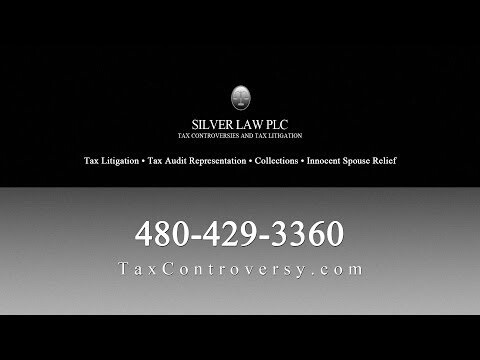 Call Silver Law PLC in Arizona today to discuss your legal needs.